Here’s what the documents look like. This example is for my maternal grandparents Seymour Berman and Vivian Klein Berman. I didn’t discover anything new from this particular set of documents, although this may be the first time I’ve been able to document that Seymour’s father’s “middle” name is Wolf. I did learn new information from other orders. The fourth page is a certificate of consent; Vivian was almost 18 at the time of completing the affidavit, so her parents Jack Klein and Lillian Herman Klein consented to the marriage. Chasing down a hunch, I ordered the affidavit and license for the marriage of Rose Neckameyer to Louis R. Meyerson. I wanted to see if this Rose Neckameyer was the same individual as the second wife of my second great-grandfather Wolf Nachamin, Rose Schechter Nachamin (Neckameyer). The results were surprising. Not only was this the same Rose, but her second (probably third) husband, Louis R. Meyerson, appears to be the half-brother of my second great-grandfather. They share the same mother, Mollie Hecht. Further research seems to indicate that not only that, but Louis’s first wife Elizabeth is Rose’s half-sister! Rose and Elizabeth share the same mother, Ida Schechter. Rose’s father’s name based on her marriage certificate is Geotzie Lehrer. I’d never seen the name Geotzie before, but it is written several times in the affidavit and license for her marriage to Wolf Neckameyer. 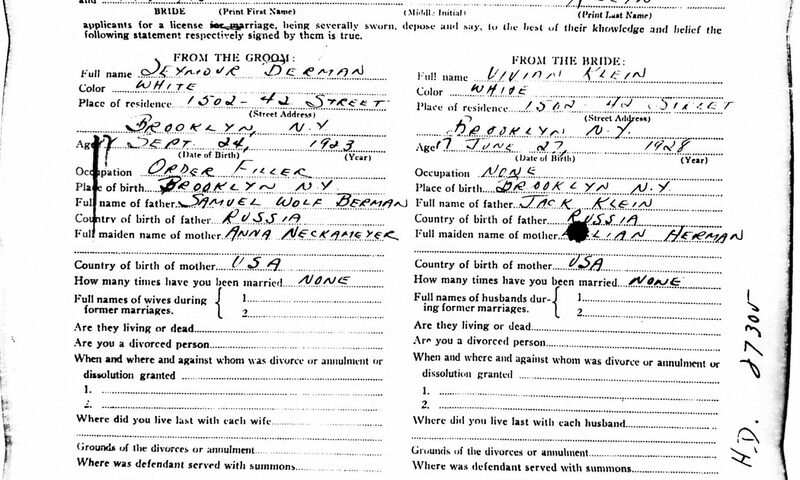 In her affidavit for her marriage to Louis Meyerson, her father’s name is written as Charles Lerner. I’m still in search of Rose’s death certificate, any immigration documents, or possibly a record of her first marriage; maybe those will provide additional information. 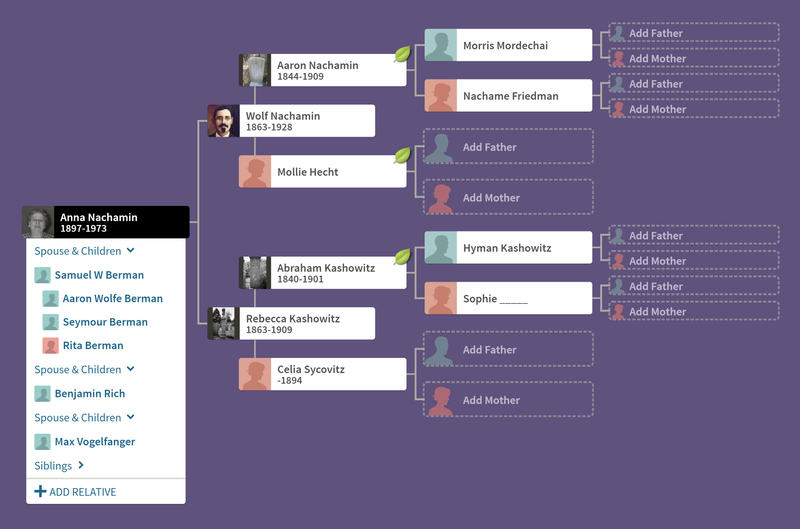 Interestingly, both the Schecters and the Nachamins seem to have established their surnames around this time — at least the surnames that stuck — based on the mother’s name rather than the father’s. You can search the index for these affidavits and licenses on FamilySearch (free, login required) or Ancestry.com (payment required), or you can browse the images at the Internet Archive.